Coworking: Our Window into the Workplace of the Future? Coworking has grown at a rapid rate, with the number of facilities almost doubling each year since 2006. This workplace option, which began as a live-work loft, has grown to over 1,000 locations in the U.S. and 3,040 globally. Coworking facilities are a cost effective workspace option for start-ups, small businesses, entrepreneurs, and the self-employed. By offering professional space, including individual desk space (dedicated or unassigned), formal and informal meeting spaces, private offices, as well as professional services and amenities like Wi-Fi, printing, and cafes. More importantly, coworking spaces are participative, hands on communities of like-minded people that learn from one another, socialize together, and help eachother achieve their goals. Corporations are also utilizing coworking spaces as “strategically flexible” options to reduce demand on their own real estate portfolios. 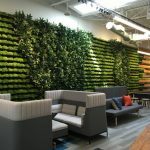 Coworking spaces can accommodate peak demand, or support special project teams for a set period of time, and can be used as a way to maintain connections to unique, innovative business communities. 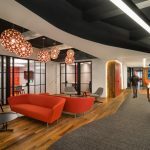 Others are creating “internal” coworking spaces, offering employees the opportunity to serendipitously connect with colleagues from different business units and functions. By providing the curated sense of community and the choice to “opt in,” we propose that coworking spaces will be one option corporations use to improve active employee engagement, currently rated at 30 percent by the Gallup organizations survey. The commercial interior design industry, including furniture manufacturers, is embracing this shift in real estate strategy by providing products that support these spaces. Allsteel is one of several manufacturers that has partnered with coworking sites across the country. Let’s take a closer look at a couple of coworking facilities. Inspired by coworking spaces he’d seen in Bellevue, WA and Chicago, Co-Merge founder and president, Michael Kenny’s vision went further than just a meeting space. When he set out to transform the nondescript building in San Diego’s financial district, he knew that the environment needed to be versatile and accommodating of a wide variety of workers, types of business, and team sizes. Kenny’s key to creating the flexible, productive space he envisioned was furniture. Using a variety of Allsteel products, Kenny and his team created several work zones in a roughly 9,000 square foot building, including areas specifically designed for collaboration, training, and individual focused work. To date, Co-Merge has attracted a wide array of workers including real estate agents, sales representatives, attorneys, accountants, web developers and programmers, and a host of freelancers. Additionally, larger companies are also beginning to utilize Co-Merge as a cost-effective alternative to the traditional workplace. As spaces continue to evolve and grow, expansion often happens outside of the four walls of the actual coworking space. Most recently, coworking facilities began creating networks, where users can subscribe to memberships of several individually owned facilities. For example, if a user is based in Boston but traveling to New York City, he or she can use a facility in either location. Other facilities, such as Workbar, are creating their own networks of multiple locations within major metro areas. Workbar originated in Boston and opened a second location in nearby Cambridge in 2013. It was founded with the goal of providing space to accommodate a varied number of work styles – from collaborative, to private, to dedicated teamwork. Workbar also offers a program called “OuterSpaces” in the Boston metro area, which thoughtfully matches emerging companies in need of dedicated space with established companies that have extra capacity. Some coworking facilities also offer unique insights into new furniture product development. For example, Allsteel is currently working with Workbar and its members to gather conceptual feedback and test new products, making for an informal, ongoing focus group. This process allows Allsteel to evaluate market readiness, product performance and end-user feedback, enabling a continuous dialogue that is essential for future product development. Workbar’s Cambridge space is currently outfitted with a variety of Allsteel products, including Gather, Stride, Clarity and Relate. The Global Workspace Association anticipates that coworking will continue to grow for the foreseeable future3, driven by factors including the predicted growth of the contingent workforce4. Parallel to that growth, we predict that coworking will become a more visible component of the corporate workplace strategy, both as an external resource and as a model for internal workspaces.